I have missed my favorite tomato salad until these past two weeks, when our tomatoes finally decided to ripen. This recipe was going to be in my cookbook but it didn’t make it in the last cut, so here it is for you to try. You might not think you need a recipe for tomato salad, but we Calabrians are particular about ours. 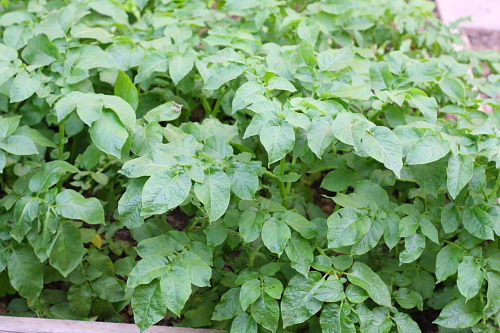 The tomatoes must be firm, even a little greenish; we consider them too soft for salad when they are ripe. The onions must be red and sweet, like the elongated torpedo-like cipolle di Tropea or those labeled “Italian sweet.” Calabrians also use dried wild oregano in this salad, either home-dried or purchased at a farmers’ market. And most would add a generous amount of chopped fresh peperoncini (hot red peppers), but you can omit them. I salt the salad 10 to 15 minutes before serving to draw out the juices; we always soak them up with bread. For an easy summer lunch, I sometimes fold in a jar of top-quality Calabrian tuna. I could eat this salad almost every day! Slice the onion halves thinly from stem end to root end. Place the slices in a bowl and cover with cold water for 5 minutes. Set aside. Core the tomatoes. Cut plum tomatoes in half lengthwise, then cut each half into 2 or 3 wedges. If using round salad tomatoes, cut them in half through the stem end, then cut into wedges. Place the tomatoes in a non-reactive bowl. Drain the onions and add them to the tomatoes along with the garlic. Add the oregano, crumbling it between your fingers as you add it, and the hot pepper, if using. Add 2 teaspoons salt and the olive oil. Toss gently, then taste and adjust the seasoning. Let stand for 10 to 15 minutes to draw out some juices before serving. Last month I was worrying that my garden wasn't doing as well as last year since the weather had been unsually cold for the Bay Area. But after taking some pictures today and comparing them to last year's, I was amazed at how similar the garden is. After all that cold weather everything seems to have caught up to about where it was last year. But this year we have a new garden member: actual kiwi fruit on the vines! I planted the vines three years ago and have patiently waited, and this year it finally happened. Last year, having almost given up on them, I went to the nursery where I had purchased the vines and asked whether I really had a male and female plant. The lady behind the counter reassured me: "It takes three to four years before kiwi bear fruit". Well, she was right! The fruit finally showed up this year and lots of them! I'm happy to see my vegetables in such good shape. I've been tending them all by myself this past month since my parents are vacationing in Calabria. 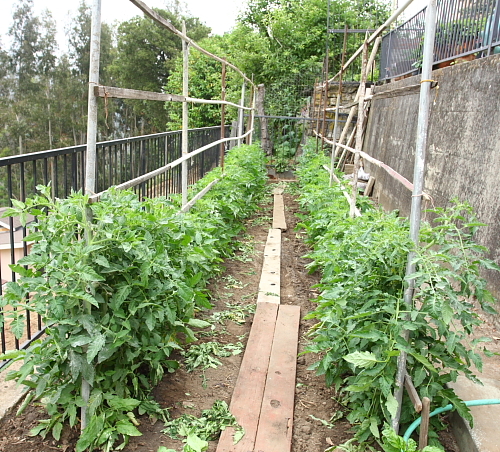 I have just a few more weeks on my own and then I will get lots of help with watering, tying and pruning those tomatoes. Take a look at last year post, so you'll know how to remove the suckers from the tomato plants. The Romano beans are up to the top of their wood poles, loaded with flowers and tiny beans which I'll soon pick. The zucchini plants have started producing flowers and zucchini. and the peppers and eggplants are doing just as well. I think my parents will be happy with the results! I am so happy with the tomato harvest that I want to share some of the photos of it. I will be using the tomatoes this Friday for my cooking class, "A Tomato Dinner from My Garden" and my students will have a chance to taste every variety that I grow. The rest of the tomatoes my mother and I will can on Saturday. Here is a shot of my favorite tomato this year: "the little horned one", there on the vine in the lower left corner, ripe and ready to be picked. The plant is of the "cuore di bue" or "ox heart" variety that my dad planted along with the San Marzanos and it produced more tomatoes that I thought it would. I didn't want to pick it, because it was so cute, but it finally ended up in the box along with its mates. Here is my mom picking the San Marzanos. Look how many tomatoes each cluster produces. I made lots of trips from the garden to the house yesterday; I think I probably picked about 100 pounds of tomatoes! My mom likes to keep them on a flat surface, not in a box, until we are ready to can them. We usually keep the tomatoes in my basement for four or five days. The temperature is cool there and this will maximize their sugar content and turn them a deep red. Take a look at the table covered with them all and then, if you really want to be impressed, check my previous post to see the size of my garden. Can you believe how many tomatoes you can grow in a small area? The next harvests will be somewhat smaller, but I will end up canning more than 80 jars for the season and still have plenty to eat every day, as well as enough to bring to my cooking classes. The roasting concentrates their flavors by caramelizing the natural sugars that they taste like candy. They are good to place on top of a bruschetta with ricotta, or toss with olive oil, garlic and lots of fresh basil in some pasta. They are also tasty on top of pizza, along with other roasted vegetables. 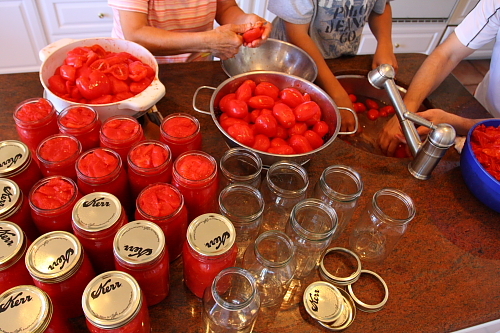 I will continue this post next week with picture of my canning day. I promised you in May that I would post some pictures of how my vegetable garden looks after a month. Compare the photos in the previous post to those below to see the difference a mere four weeks make. 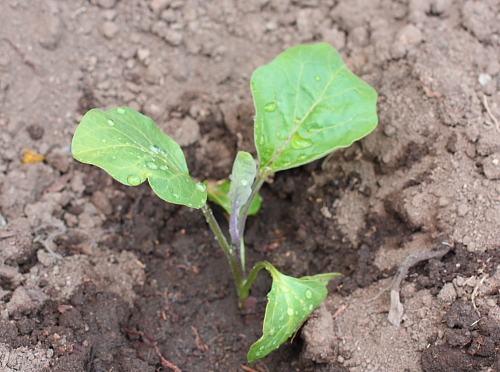 It is amazing to see seedlings change into fully grown plants and start producing fresh summer vegetables. The zucchini are producing beautiful blossoms and fruit. 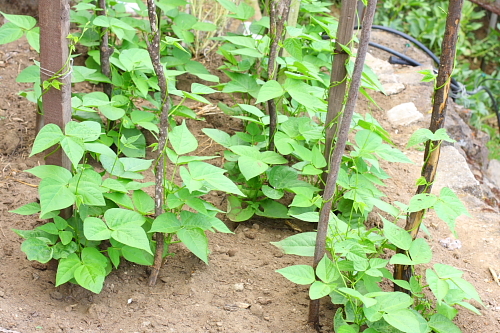 The romano beans have grown to the top of the wood poles and the beans are ready to be picked. The tomato plants are on their way. My dad builds the entire trellis with recycled material he has around my garden, like wood poles, metal posts left over from when we built my house, and left over irrigation tubing. He buys nothing and recycles everything from year to year. The poles are about 6 - 7 feet high--that's as high as we can reach to tie the tomato stems--and planted about 6 feet apart. These poles support the horizontal bars, which he makes out of wood sticks or tubing, are placed about 12 inches apart. When the plants start producing, the trellis looks like a wall of tomatoes. You will have to wait until August to see what I am describing. In the meantime, if you have planted San Marzano tomatoes and would like to use this time-honored Calabrian technique, please feel free. Take a look at the picture below to see how my dad ties the tomato stems to the trellis. He uses strips of his old worn shirts! We leave suckers on the lowest portion of the tomato plant, as many as five or six, and these become the main branches that will produce tomatoes. All the other suckers that are produced by these stems will be removed as the tomato stems climb up the trellis. You want to prune the suckers when they are small, no more than two to four inches. Suckers this size can be snapped off with your fingers, but suckers any thicker than a pencil should be cut with a pruner or knife to avoid damaging the plant. This is the best time of the year in my garden; I get to pick fresh vegetables on a daily basis. Even my fig trees are ready to produce wonderful sweet figs. They will be ripe enough to eat right off the tree by next week. I have two large fig plants, a Kadota (green-skinned and golden flesh) and a black mission tree. I'll have more on figs in a future post. While I was in Calabria the first week of May, my parents planted tomato plants in my garden for me: 30 San Marzanos, a couple of Early Girls and few sweet red 100s, which are cherry tomatoes. 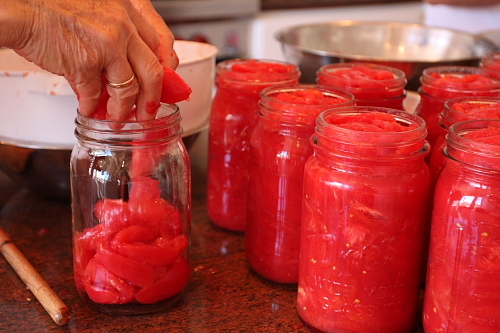 The majority of the San Marzanos will end up canned in jars, although we do eat a few in salads and I bring them to use in my cooking classes when they are at their peak. (The tomatoes, not the classes!). All the other tomatoes we eat fresh off the vines. Following the "from scratch" theme of this blog, my parents always start the tomato seedlings from the seeds they harvest from the tomatoes of the previous season. The original seeds were the ones they brought from Calabria in the 1970s. My dad also planted zucchini, peppers (both the Italian sweet and the Calabrian hot), eggplants, and Romano beans. One of his secret is to give each plant a nice drink of "manure tea". Yes, you guessed it: goat manure steeped in water, truly smelly stuff. He gives each plant about a quart of this tea and it acts like a booster shot. It is amazing how they take off. He always places the seeds of the Romano beans directly into the soil in early April and as you can see from the picture below the plants are already on their way up the poles. My dad always uses old branches to make poles for the beans to climb on. 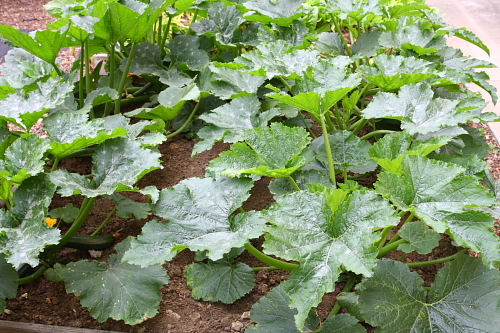 Here are pictures of the zucchini, eggplant, cucumber and pepper plants. I will give you a garden update next month so you can see how everything is progressing.